What is Laparoscopic Nissen Fundoplication reflux surgery? Once you’ve had a positive diagnosis of gastro-oesophageal reflux disease (GORD) or laryngopharyngeal reflux (LPR), the next step is to establish the right treatment for you. These can include reflux medication, changes in diet, lifestyle tweaks and surgery. Surgery is usually only recommended if lifestyle measures or medicines haven’t helped. There are a number of surgical procedures available – here we look at the Laparoscopic Nissen Fundoplication surgery. 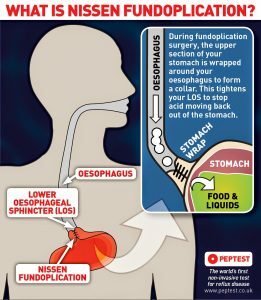 The Laparoscopic Nissen Fundoplication procedure involves a section of the top of the stomach being wrapped around the oesophagus to mimic the function of the LOS and stitched into place. The procedure tightens the closing mechanism at the lower end of the oesophagus, creating a one-way valve which prevents stomach acid from moving back into your oesophagus. Nissen Fundoplication is usually done through laparoscopic surgery under general anaesthetic and takes about 1.5 hours – the abdomen is accessed by four incisions and inflated by gas. If clips or non-dissolvable stitches are used, they will be removed after about seven to 10 days. In the UK, Nissen Fundoplication is available on the NHS, or in private it costs around £5,000. In the US, it can typically cost around $10,000 to $15,000. Studies have found that many patients undergoing the procedure are symptom-free after 10 years, with one study reporting that the long-term outcome is considered “good or excellent” by 90 per cent of patients. Patients report low rates of complications following the surgery. Because the valve at the top of your stomach is tighter, it can lead to a build-up of gas in your stomach and cause belching, bloating and flatulence. Some patients also report difficulty in eating and digesting food, and others have problems with dysphagia (difficulty swallowing). These side effects usually resolve over the course of a few months; however they can persist in about 1 in 100 cases. If the wrap is thought to be too tight, the surgeon may suggest oesophageal dilatation to weaken it. After surgery, you are advised to avoid certain foods or drinks such as fizzy drinks. I have just had this done and hiatus hernia repair too. I am on week 3 and feeling very well. I have stuck to the correct diet and the horrible reflux I suffered before, has at last gone! Pending the results of a manometry test, my doctor has scheduled my surgery for late April to fix my hiatal hernia (which returned after previously being repaired during a gastric sleeve procedure). She insists on the manometry test because a previous test showed esophageal dysmotility, I have no problem swallowing and no acid reflux. Just eating a bit too much or drinking too much while eating. How are you doing now?